Earlier today I heaved a rather large suitcase (heavy from Saturday’s frantic run around Brussels to buy various Christmas presents), a large bag, a laptop bag and a handbag onto the Thalys to take me home to my parents’ place in Essen, Germany. After 14 years of having to fly from various places in Europe to see my family, it is amazing to be able to take a direct train to go home, with no risk of delayed trains or bad traffic to get to the airport or long queues to get through security. Like every year, I am dividing my time between Germany and Italy and after spending Christmas with my family, I will be flying to Rome on Friday to join Alessandro and his friends and family for further Christmas celebrations and to ring in the New Year. After what can only be described as a very ‘full’ year, I am looking forward to a bit of downtime over the break as well as seeing a bit more of Alessandro than I have been able to since he started his course in Turin back in September and has been busy preparing for various exams. I should be back in this space with a new post in the first week of January and, until then, I wish you all happy holidays and a wonderful start to the new year! As a final hurrah before the holidays, I wanted to share the recipe for these Rye, Walnut and Cardamom Crescents. While Christmas is only a few days ago and you may have better things to do than bake cookies this late, me and my sister actually have a tradition of baking cookies as late as 23 December in the evening (since our work schedules would not always allow us to get together much earlier) and these cookies are quick and easy to prepare (truth be told I always make them in a food processor!). Also, these cookies are made with rye flour and I have been meaning to tell you about how I am slowly but surely growing rather fond of rye as an ingredient! It started with a twist on treacle tart using stale rye bread in place of the breadcrumbs, then I bookmarked these Swedish Rye Cookies from Heidi’s blog, and only a few weeks ago I started working on a Lebkuchen recipe using rye bread. While Alessandro is studying in Turin, his pasta maker is on permanent loan to me, so I also bookmarked this Rye Pasta recipe (again, from Heidi’s blog) to try. Meanwhile, I finally got hold of rye flakes and am looking forward to trying it in baked porridge recipes and making a rye version of these Oat and Cardamom Florentines as well. However, pending my trying out new rye recipes, by far my favourite thing to do with rye flour at the moment are these Rye, Cardamom and Walnut Crescents. While the recipe for these crescent-shaped cookies is but a simple twist on a Vanillekipferl recipe, a cookie traditionally eaten around Christmas in both Germany and Austria (where the flour, ground almonds and vanilla bean in the Vanillekipferl are swapped for rye flour, ground walnuts and a generous pinch of ground cardamom), the resulting cookies take on an entirely different character. Vanillekipferl have mass appeal because no one, young or old, can resist a Vanilla-flavoured cookie with a crumb so buttery the cookies practically melt on your tongue. 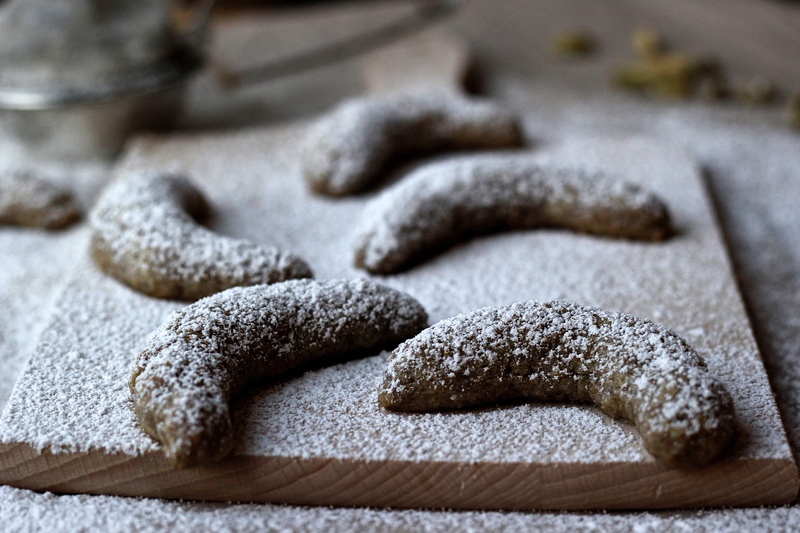 Using rye flour gives these crescents a different texture – somewhat coarser and sandier. Together with the dark colour of the rye flour and the complex flavour of the walnuts (earthy and fruity while verging on bitter thanks to the tannins in the skin of the walnuts), these crescents appear rather rustic at first bite. But at second bite, you are hit with the sweet and spicy flavour of the cardamom, which creates this perfect contrast to these otherwise rather rustic cookies. A final dusting of cardamom-laced icing sugar on these not overly sweet cookies and these crescents end up being rather moreish (I ate close to half a batch by myself when I first baked them and had to take the remainder to work to stop me from finishing the entire batch on my own). So if there is still any space left in your cookie tin, I would highly recommend you bake a batch of these crescents! Note: Firstly, if you are in the habit of baking with cardamom but have yet to buy cardamom seeds in their pods, I would recommend switching to buying cardamom seeds in their pods going forward. Cardamom has a very delicate flavour which fades quickly once the seeds are ground. To grind the cardamom, I simply squash the pods with a large knife and then grind the seeds in a pestle and mortar (and I keep sifting the ground cardamom until I have the required amount). Secondly, depending on the size of your crescents, the baking time will vary. For large crescents (approx. 15g of dough per crescent), the cookies will take ca. 15 minutes to bake and the recipe will yield ca. 20 cookies. If making smaller crescents, making the crescents will be a bit more fiddly (and you will end up with 30-plus cookies), but the baking time will reduce to ca. 10-12 minutes. For dusting: 2 tbsp powdered sugar, seeds from 2 cardamom pods (finely ground). Add the rye flour, ground walnuts, ground cardamom, pinch of salt and sugar to the bowl of a food processor. Pulse to combine. Add the cubed butter and pulse until the mixture is the texture of sand. Lastly, add the egg and pulse briefly to combine. Turn mixture out onto a floured surface and briefly work into a smooth dough, being careful not to overwork the dough. Wrap in cling film and place in the fridge to firm up for at least 1 hour. Pre-heat the oven to 175 degrees Celsius and line two sheet pans with parchment paper. Oil your hands with vegetable oil (to stop the batter from sticking to your hands) and, using scant tablespoon-sized pieces of dough, form little crescents and place them on the sheet pans (the crescents will not spread much in the oven so there is no need to leave a significant amount of space between the cookies on the sheet pans). Bake for 12-15 minutes (depending on size) until the crescents are crisp on the outside and just starting to colour. In a bowl mix the icing sugar with the ground cardamom. Dust over the crescents while they are warm. Leave the crescents to cool on the sheet pan for 5 minutes before placing them on a cookie rack to cool completely. I have not tried adding raisins to these cookies but you could certainly try working them into the dough just after you have added in the egg. You need to be careful not to overwork the tough or the cookies will be tough (rather than nice and crumbly) but if you flatten the dough, scatter a small handful of raisins on top of the dough and lightly knead the dough a few times, that should ensure the raisins are dispersed evenly throughout the dough. The one thing to add is that raisins, given their high sugar content, burn easily in the oven and/dry out and become rock hard. This is why they are typically soaked in fruit juice, tea or alcohol before being added to things like Stollen dough or other enriched dough recipes. You could try the same here to avoid the risk of burning the raisins but I am not sure how the extra moisture would affect the texture of the cookies once baked. Thanks a lot of writing so much. I would soak them in fruit juice before baking. Merry Christmas!